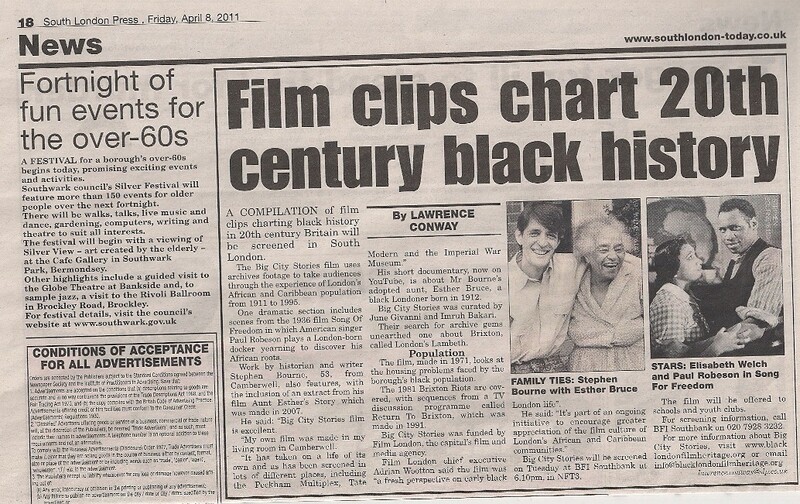 Black London’s Film Heritage presents “Big City Stories” a collection of film extracts depicting Black London in the twentieth century. Big City Stories is a new, fresh perspective on early Black London life in an expanding and ever changing metropolis. Footage is included which reveals the shifting and often contrasting perceptions about the African and Caribbean citizens of London at various historical periods across the century: the 1930s, “World War II”, and from the 1950s onward when areas such as Brixton and Notting Hill gained iconic significance. Big City Stories will be launched at the Ritzy Picturehouse, Brixton on Saturday 26th March 2011 as part of the celebrations to mark 100 years of that cinema’s existence, and at the BFI Southbank on 12th April 2011.